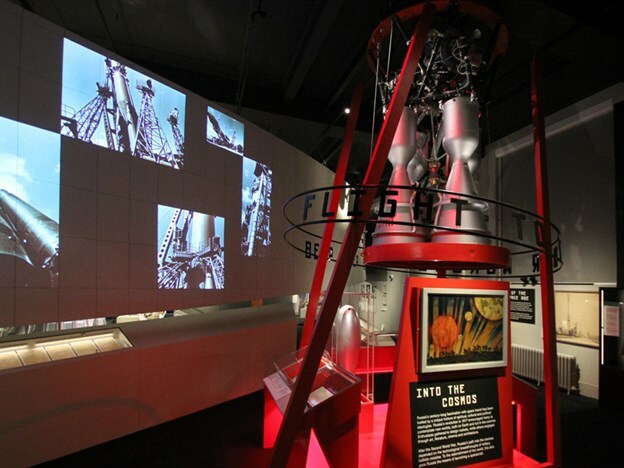 Having worked with both Real Studios and Flemming Associates on several occasions in the past, we were delighted to be asked to be a part of this prestigious project for the Science Museum in London. 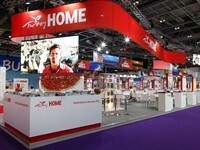 We were asked to design, supply and install a large curved graphic and projection screen to form part of a new exhibition. 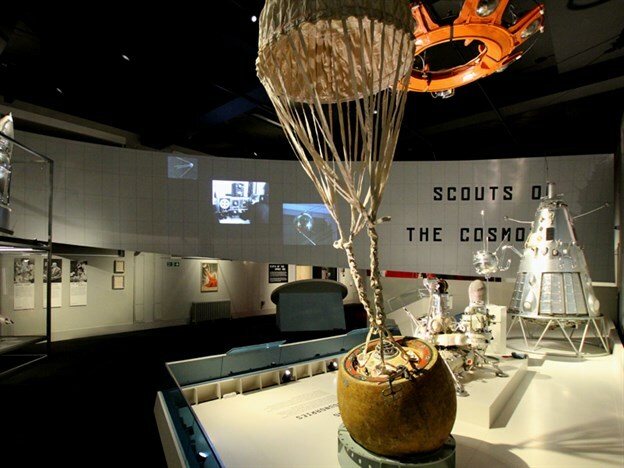 Cosmonauts: Birth of the Space Age is an exciting exhibition revealing the most significant collection of Russian spacecraft and artefacts ever to be shown in the UK. The design intention was to create a curved graphic element that ties information together through space, and is also used as a projection area for three different projections. 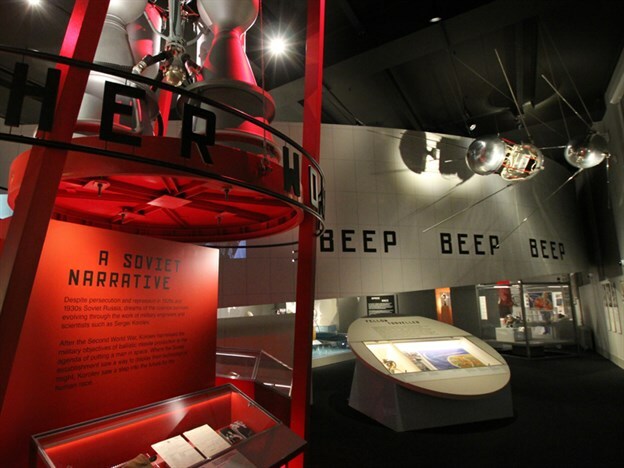 It was essential to keep the screen as simple as possible to avoid taking anything away from the exhibition below. We therefore used a previously proven aluminium framework with a blackout printed fabric which has a dye sublimate print on it. At 25m long and 5m tall at its tallest point, the graphic re-registration on the tapered grid-like screen had to be perfect. 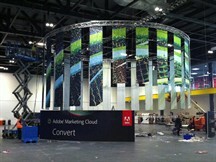 The entire screen was rigged from above using a bridle cable system allowing the frame to be supported twenty times from ten different fixing points. 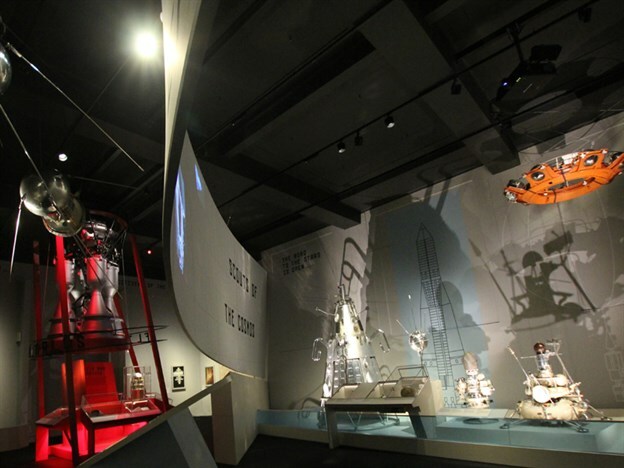 The exhibition is running at the Science Museum from 18 September 2015 to 13 March 2016.